Seriously, who doesn’t like the idea of deep dark chocolate densely packed into cute square packages thats can be easily popped in a mouthful? Scoop up some vanilla ice-cream and yumms, I think (almost) no one can resist. Been quite some time since zzz baked brownies, and we thought it would be a good idea to give everyone a nice treat on Sunday. Needless to say, all brownies all all snapped out! My dear niece’s eyeballs literally glistened when we told her she could pack an extra brownie for school the next day! Preheat oven 170 deg celcius. Line a 9 by 9 inch square tin with parchment paper. Melt chocolate, butter, sugar and vanilla in double boiler. Remove from heat. Beat the eggs slighlty and add to chocolate/butter mixture slowly, whisking all the time. Fold in flour and chopped hazelnuts. (Add 2 tablespoons of milk if the batter is too dry). Bake for 20-25 minutes. Insert toothpick to test if the cake is done, a little chocolaty gooeyness is OK! 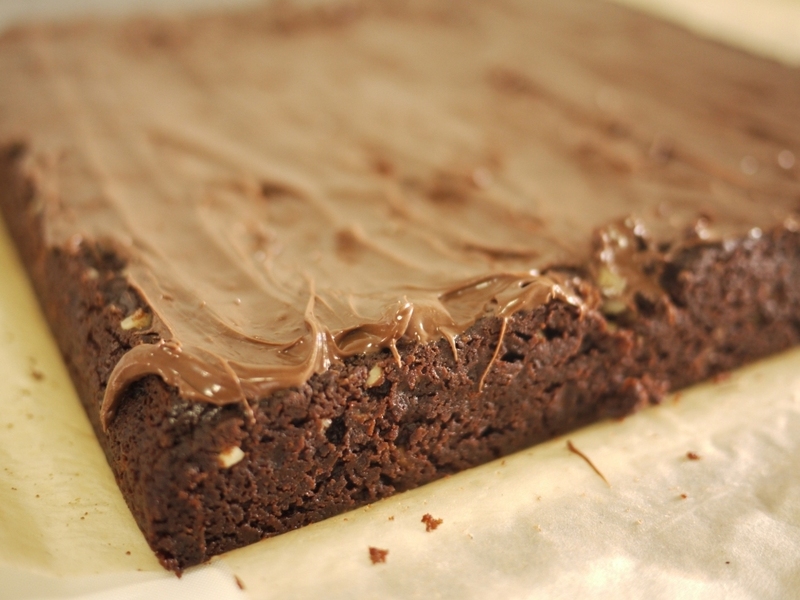 Spread nutella generously on brownies. This entry was posted in Bake and tagged brownies, chocolate, nutella, valhorna on November 22, 2011 by three3seconds.